The idea of creating a quartet of stringed instruments, the Ellen M. Egger Quartet, was born from a conversation with Fritz Maytag and is a working memorial to Fritz's sister Ellen Egger, one of four siblings and and an accomplished musician and teacher. The four instruments are loaned individually to promising students in far-flung places for an indefinite period, and then are reassembled once a year for a concert in San Francisco. Memorable performances have taken place at the California Palace of the Legion of Honor with such distinguished quartets as the Angeles Quartet, the Pro Arte Quartet, the Lafayette Quartet, the Pacifica Quartet and the Turtle Island Quartet. 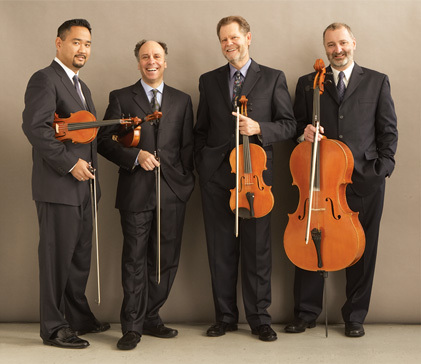 For several years, it has been the musicians of the Alexander String Quartet who have reunited the two violins, viola and cello (shown in the photo below) in performances, and in their 2009 recording of the complete Beethoven Quartet Cycle. The two violins were made on a 1705 Stradivari "P" form. The viola is made on a personal model. The violoncello was constructed on a modified "B" form of Antonio Stradivari 1709. The labels are dated 1987.